Intimidating debt markets back in 1993? How about nowadays? When Mr. Carville paid reverence to the bond market, U.S. marketable debt totaled about $16 TN. Non-financial debt was at $13.1 TN, with Households on the hook for $4.2 TN, Corporations $3.8 TN, State & Local governments $1.1 TN and the federal government $3.3 TN. The Fed’s balance sheet ended 1993 at $424bn. Fast-forward to June 30, 2012. Total U.S. marketable debt ended Q2 at about $55 TN, an increase of 238% since 1993. Non-financial debt increased 212% to $38.9 TN. From 1993 levels, Household debt jumped 207% to $12.9 TN. Corporations have boosted borrowings to $12.0 TN, an increase of 215%. State & Local government debt of $3.0 TN was up “only” 159%. Federal marketable debt ended Q2 at $11.1 TN, up 231% since 1993. Total Financial sector Credit market borrowings increased from 1993’s $3.3 TN to $13.8 TN, with ABS up 298% to $1.86 TN, Agency/GSE securities up 295% to $7.54 TN, Broker/Dealer borrowings up 437% to $2.05 TN, and Wall Street “funding corps” up 593% to $2.29 TN. Total outstanding Corporate and Foreign Bonds jumped from $2.05 TN to $11.96 TN (up 483%). The value of Corporate Equities rose 285% from $6.30 TN to $24.22 TN. The Fed’s balance sheet inflated 580% to $2.88 TN. Since 1993, Private Pension Fund Assets have grown 180% to $6.39 TN. State & Local Pensions were up 187% to $1.04 TN. Nothing, however, compares to the growth experienced by the hedge fund community, which grew from about $50bn in 1993 to recent estimates approaching $2.2 TN (growth of 4,300%). And, importantly, the explosion in debt and financial assets management has been a global phenomenon. I have argued that economic structure matters. I have further posited that a defining feature of contemporary economies (especially with respect to the consumption and services-based U.S. structure) is the capacity to absorb enormous amounts of Credit expansion/purchasing power with little impact on traditional measures of consumer price inflation. Moreover, I have attempted to explain how, when Credit expands, this finance flows into the economy before much of it finds its way out into the “global pool of speculative finance.” I have further argued that this ever-expanding pool of unwieldy finance is this Credit Bubble cycle’s most dangerous inflationary manifestation. The Greenspan Federal Reserve sold its soul back during the 1998 bailout of Long-Term Capital Management. Even prior to 1998, Fannie and Freddie had been playing the critical role as liquidity backstop to the hedge fund community in the event of market stress. I wrote some years ago that speculators could take highly-leveraged positions in MBS, confident that the GSEs were at anytime willing to pay top dollar for this paper – especially during bouts of market tumult. The Federal Reserve took a decidedly more “activist” approach to market interventions during the 2001/2002 corporate debt crisis and recession. After reading Dr. Bernanke’s and others’ “inflationists” writings, I recall a CBB about a decade back where I suggested that the Fed was determined to have hedge funds unwind their short positions in Ford and other corporate bonds - and furthermore entice them into going (leveraged) long. And, sure enough, the funds did adjust and made a ton of money. The Fed was subtler back then, but they were sowing the seeds for the recent backdrop where they’ve essentially guaranteed anyone that speculates in MBS or Treasury securities (corporate bonds, municipals debt, equities?) seemingly risk-free speculative returns. I was always impressed that ECB President Jean-Claude Trichet would categorically – and repeatedly - state that “the ECB never pre-commits on interest rates.” The Fed has for years now operated otherwise, believing it advantageous to signal its intentions specifically to the marketplace. This has proved quite advantageous for some, but clearly much to the disadvantage of system stability. The ECB seemed to better appreciate that illuminating too much to the speculator community would simply ensure destabilizing speculation – and attendant Bubbles – based on the expected course of ECB policymaking. Betting on the predictable path of Federal Reserve policy must by now be one of the more lucrative endeavors in history. In a CBB a decade ago, I made a flippant comment about the financial and economic landscape, writing “The titans of industry run money.” Never did I imagine back then that hedge fund assets were on their way to $2.2 TN, Pimco to $1.7 TN and Blackrock to $3.6 TN. Betting successfully on Fed policy has created billionaires . And, more importantly, those that have played this extraordinary policymaking backdrop most adroitly today control unimaginable sums of financial assets – in the hundreds of billions and even Trillions. There’s been nothing comparable in terms of the concentration of financial power and speculation since the late-twenties. Ironically, this historic financial windfall even accelerated following 2008’s near financial collapse, as policy effects on financial markets reached only greater dimensions. Those that played it most successfully amassed only more incredible fortunes. And the stakes over just the past few months have been enormous. And those with the best sense – or, more likely, the best information – of how things were going to play out in Frankfurt and Washington added further to their kitties. And, predictably, additional assets to manage flow to the victors. ECB President Mario Draghi is clearly a very intelligent man. He is an MIT trained economist with the most impressive credentials. He has decades of experience as a professor, World Bank official and governor of the Bank of Italy. Mr. Draghi was also a vice chairman at Goldman Sachs for several years (2002-2005). Clearly, Draghi understands markets and the dynamics of speculative finance. When he warned against betting against the euro and European bonds the marketplace took notice. Amazingly, the ECB has gone from being adamantly opposed to pre-committing on rates to openly determined to pre-commit to huge open-ended market interventions and price support operations. After holding out, the ECB finally sold its soul – and the speculators have been giddy. Bill Gross has been rather open about it: “We’re buying what the Fed and ECB are buying.” And Mr. Gross and others have been buying Spanish and Italian bonds, with a brilliant plan to sell them back to the ECB at higher prices. There’s a very large global contingent keen to place such bets, after similar trades in U.S. Treasuries and MBS have made gazillions. There’s a lot that will likely go really wrong in Europe, perhaps even in the short-term. Greece is an unmitigated disaster, and Spain is running a close second. There was further dismal economic news this week, most notably from France. But that hasn’t in the least diminished recent keen speculative interest in European debt. Indeed, after the Fed sold its soul, I’ve often believed that the speculators became adept at recognizing periods of rising systemic stress and market vulnerability as opportunities to load up on Treasuries and MBS. And then it becomes a game: “OK Federal Reserve, make the value of these securities (or spread trades) go up or we’ll dump them.” They haven’t had to dump. The ECB has similarly opened itself up to blackmail. “Be ready with the OMT as promised - or we dump.” “Spanish and Italian politicians, play ball or we’ll dump.” “Mr. Weidmann and the Bundesbank, fall in line - or we dump!” “All policymakers everywhere, play or we dump.” At least in Europe, this is developing into one fascinating multifaceted game of chicken. Well, I’ve been ranting for awhile now about the “biggest Bubble in the history of mankind.” At this point, things increasingly remind me of 1999 and 2006. Bubble Dynamics eventually reach a degree of excess that is too conspicuous to deny. Yet the stakes are so much greater today. The amount of global debt is so huge and the quality so poor. It’s completely systemic and global. Dangerous excesses have gravitated to the core of Credit and monetary systems. Policymakers are now “all in” in a desperate gambit to hold financial and economic fragility at bay. And, dangerously, highly speculative markets seem determined to extend their divergent path from economic fundamentals. It’s frightening how enormous and enormously powerful dysfunctional global markets have become. SOME perils are easier to dodge than others. A helicopter equipped with Honeywell’s latest safety system can spot danger through dense cloud. It can even spot hazards that don’t yet exist. If the pilot flies towards the top storeys of New York’s Freedom Tower—which have not yet been built—the control panel flashes red and warns him to change course. America’s fiscal peril is easy to see, but the pilots are squabbling over the controls while the economy hurtles towards disaster. At the beginning of next year federal tax increases and spending cuts equivalent to about 5% of GDP will automatically come into force. 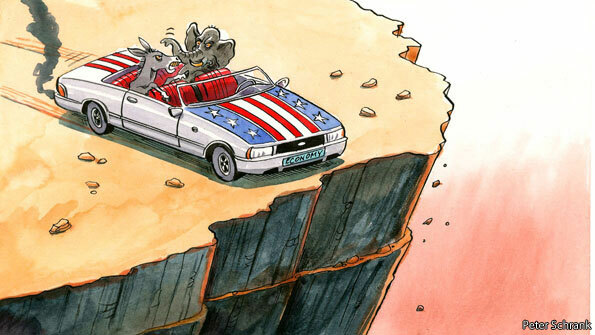 America will go over this “fiscal cliff” unless Democrats and Republicans in Congress agree on a deal to avoid it. So far, they show little sign of agreeing on anything except that the other side is to blame for their failure to compromise. For corporate America, this is terrifying. Going over the fiscal cliff could knock enough points off the growth rate to drive America into a recession, predicts the Congressional Budget Office, a non-partisan body that analyses the economic effects of federal laws. “Everybody’s nervous,” says David Cote, Honeywell’s boss. “It could cause a global recession,” frets Klaus Kleinfeld, the chief executive of Alcoa, an aluminium firm—though he doubts it will actually happen. The cliff exists because several temporary measures are set to expire at the same time. George W. Bush’s tax cuts, which were extended for two years under Barack Obama, are due to run out at the end of 2012. So are Mr Obama’s temporary jobs measures, such as a payroll-tax holiday and extended unemployment benefits. The Alternative Minimum Tax, a levy originally aimed at the rich, is set to hit 30m middle-class Americans. Medicare, the federal health programme for the elderly, will slash payments to doctors by nearly 30%. And thanks to the failure of a congressional “budget supercommittee” to agree on a debt-reduction deal last year, automatic cuts in federal spending are due to start on January 15th. All told, America faces a fiscal squeeze equivalent to more than $600 billion in a single calendar year and $6.1 trillion over ten years. Nothing will change before the election, and there is probably not enough time after it and before the end of the year for lawmakers to thrash out a proper budget deal. So a temporary fix is likely. Some tightening will probably occur regardless of any deal, but no one knows how much. How are companies responding? “We’re not hiring,” says Mr Cote. He is far from alone. J.P. Morgan, an investment bank, reports that 61% of its American clients say the fiscal cliff is affecting their hiring plans. That is one reason why unemployment is so high. Durable-goods orders plunged 13.2% in August, partly because companies are too scared to invest their cash mountains to expand production. They don’t know what tax rates will be next year. They don’t know whether their customers will suddenly start shopping around for cheaper groceries—the Tax Policy Center, a think-tank, predicts that the expiry of all Mr Bush’s tax cuts would raise taxes by $3,500 per household. Businesses also don’t know whether the government will rein in spending that affects them. Military contractors face a walloping, since half the spending cuts will come from the Pentagon’s budget. “We’re worried,” admits a defence-firm director. Hospitals are worried, too. So are companies that sell to consumers, or to other companies that sell to consumers. Uncertainty makes planning hard. That has consequences. “If you can’t plan, you don’t invest. If you can’t invest, you won’t hire,” says Bruce Josten of the US Chamber of Commerce, a business lobby. Uncertainty about future economic conditions has added at least a percentage point to the unemployment rate, according to Sylvain Leduc and Zheng Liu of the Federal Reserve Bank of San Francisco. A survey by the National Federation of Independent Business, a small-business lobby, supports this theory. 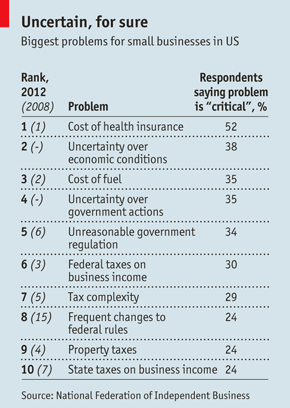 The top ten problems cited by the NFIB’s members include “uncertainty over economic conditions”, “uncertainty over government actions” and “frequent changes in federal tax laws and rules” (see table). Business-backed groups such as the Campaign to Fix the Debt argue that, in the medium term, Congress needs to bring America’s swelling debts under control. All plausible deals to do this involve both tax hikes (which Republicans oppose) and cuts to entitlements (which Democrats hate). The choice, says Mr Cote, is between fixing the budget “thoughtfully and proactively”, or waiting “until the bond market forces us to do it, like Greece did”. Some say the best tactic would be to walk one pace over the cliff and then turn back. Many Republicans have sworn never to raise taxes, which means they cannot agree to let any of Mr Bush’s tax cuts expire. But if no deal is reached and they expire automatically, restoring them for households that earn less than $250,000 a year (which the Democrats want) would count as a tax cut, so Republicans could agree to it without breaking their pledge. This sleight of hand was devised by William Gale of the Brookings Institution, a think-tank, and Peter Orszag, a former budget director for Mr Obama. Will it fool anyone? Perhaps. Benjamin Franklin once said: “Nothing is certain but death and taxes.” These days, taxes are far from certain. And if that doesn’t change, American businesses could be dicing with death. CATALONIA may be the catalyst for a renewed wave of separatism in the European Union, with Scotland and Flanders not far behind. The great paradox of the European Union, which is built on the concept of shared sovereignty, is that it lowers the stakes for regions to push for independence. While a post-national European Union may be emerging out of the euro zone crisis, with a drive for more fiscal union and more centralized control over national budgets and banks, the crisis has accelerated calls for independence from member countries’ richer regions, angry at having to finance poorer neighbors. Artur Mas, the Catalan president, recently shook Spain and the markets with a call for early regional elections and promised a referendum on independence from Spain, although Madrid considers it illegal. Scotland is planning an independence referendum for the autumn of 2014. The Flemish in Flanders have achieved nearly total autonomy, both administrative and linguistic, but still resent what they consider to be the holdover hegemony of the French-speakers of Wallonia and the Brussels elite, emotions that will be on display in provincial and communal elections Oct. 14. There are countless things that hold unhappy countries, like marriages, together — shared history, shared wars, shared children, shared enemies. But the economic crisis in the European Union is also highlighting old grievances. Many in Catalonia and Flanders, for example, argue that they pay significantly more into the national treasury than they receive, even as national governments cut public services. In this sense, the regional argument is the euro zone argument writ small, as richer northern countries like Germany, Finland and Austria complain that their comparative wealth and success are being drained to keep countries like Greece, Portugal and Spain afloat. The crisis has also produced a loss of confidence in traditional leadership, with voters punishing incumbents and mainstream political parties. That has helped more atavistic nationalist parties, like the National Front in France and Golden Dawn in Greece. But in separatist regions, the same disaffection tends to favor parties advocating independence. Heather Grabbe, who worked for five years as a political adviser to the E.U.’s commissioner for enlargement, agreed: “If you’re a small country in the E.U., like Malta or Luxembourg, you’re likely to be overrepresented in Brussels compared to your size, so go for it.” Now the Brussels director for the Open Society Institute, Ms. Grabbe said the key variable for separatism is less a matter of money than of historical grievance and language. But the crisis has also presented a real conundrum for regional leaders, because it has undermined the attraction of the European Union. In Scotland, for example, there was an assumption that if independent, it would join the bloc without a lot of fuss, since Scots are already citizens of the European Union. (After all, some 20 million East Germans became members of the European Union overnight without even having to whistle the anthem.) But would Scotland inherit the British “opt out” from the euro, or, as a new E.U. state, would it have to commit to the euro? And if so, who would be responsible for bailing out the Bank of Scotland, if it came to that? As euroskepticism rises in the United Kingdom, these issues have come to bedevil Alex Salmond, the leader of the Scottish National Party, whose slogan is “Scotland in Europe.” The 2014 referendum is supposedly timed to the 700th anniversary of a decisive episode in the first war for Scottish independence, the Battle of Bannockburn. TRADITIONALLY, the European Union has been popular with the leaders of these regions, said Josef Janning, director of studies at the European Policy Center. “They see strengthening the power of Brussels as diminishing and relativizing national governments, a process accelerated by the single market in Europe,” Mr. Janning said. Many of them have formed regional groupings that bypass the central government — Catalonia, along with Baden-Württemberg in Germany, Rhône-Alpes in France and Lombardy in Italy, for example, are regional powerhouses that call themselves “the four motors for Europe” and together have a bigger G.D.P. than Spain. The case of the Basques is a good example. With the defeat of the independence army ETA, which announced the “definitive cessation” of the armed struggle a year ago, the Basques are doing well. They are watching Catalonia and Scotland carefully, but their level of autonomy is already so high, with their own virtual embassies abroad and control over their own taxes, unlike Catalonia, that independence can, to the Basque public, seem destabilizing. European (and NATO) enlargement to the east was a major accomplishment, but it distorted the cores of both organizations, especially the European Union. And now with the new crisis of the euro, “Europe seems shakier, there’s so much anxiety,” Ms. Grabbe said. “Some of these taboo questions,” she said, “are coming out again,” with economic, legal and ethnic trouble re-emerging in the new states, like Hungary and Romania, and new divisions in the old ones. Steven Erlanger is the Paris bureau chief of The New York Times.